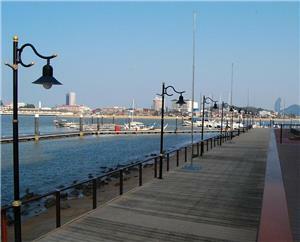 Kuala Terengganu is the royal capital of the Terengganu state in Malaysia, located at the estuary of Terengganu River and facing the South China Sea. Despite its small size of area, Kuala Terengganu still managed to claim a “city” status with the title (Coastal Heritage City) in 2008. Apart from being the main political and economic centre of Terengganu, the city is also the main gateway to most of the state’s tourist hot spots. Although Kuala Terengganu has been modernized quite a bit, the city still manages to maintain its strong heritage influence that intermixes with other cultures originating from its history of being a port. One of the most preferred way of traveling to this small, traditional city is by taking a bus to Kuala Terengganu. The main bus terminal within the area is the Majlis Bandaraya Kuala Terengganu (MBKT) Bus Terminal, located at Menara Permint on Jalan Sultan Ismail. The terminal also serves as a stopping point for travelers heading to the Perhentian or Redang Islands. Apart from that, it also offers a number of conveniences for its visitors like a decent eating joint and several shops and stalls for anyone wishing to so some last-minute shopping of souvenirs and trinkets. 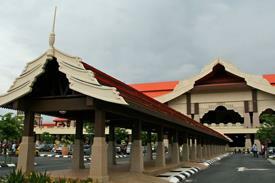 Since the MBKT Bus Terminal is the main bus terminal in Kuala Terenganu, most of the bus to Kuala Terengganu will make pick-ups and drop offs there. Some of those bus operators include Plusliner, Transnasional, Maraliner, Kesatuan Express, and more. Bukit Panorama, Redang Islands, Perhentian Island, Islamic Heritage Park, Bukit Puteri, Pasar Besar Kedai Payang (Pasar Payang), Floating Mosque, Bazaar Warisan, Duyong Old Fort, Istana Maziah, Kuala Terengganu Waterfront, Taman Awam Pantai Teluk Ketapang. Book your tickets for the bus to Kuala Terengganu today!